I love EPCOT. It is my favorite park in Disney World (mostly for the food. One day I WILL go to EPCOT's Food and Wine Festival). 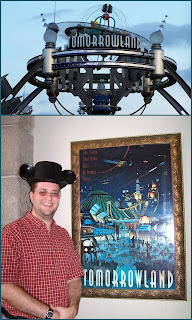 Future World is so much fun for my husband, and I think my son is going to totally love it when we go down there next year. 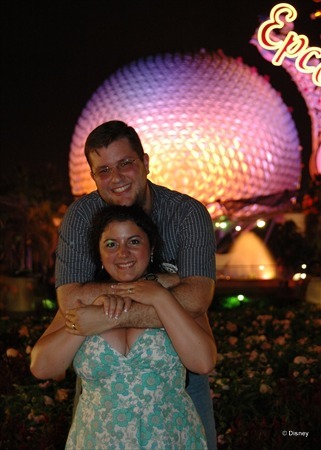 This is one of my favorite pictures from when we went to WDW on our honeymoon. Is Downtown Disney considered a "land"? To me it is. I love all the Lego sculptures, the shopping, the fun... Downtown Disney is a great thing to do on your last day when you don't have any more passes to the parks or to do in the evening to wind down from being in the parks. I have yet to see the Cirque du Soleil that is there, but I am told it is absolutely amazing. That is on my "to do" list for the future. 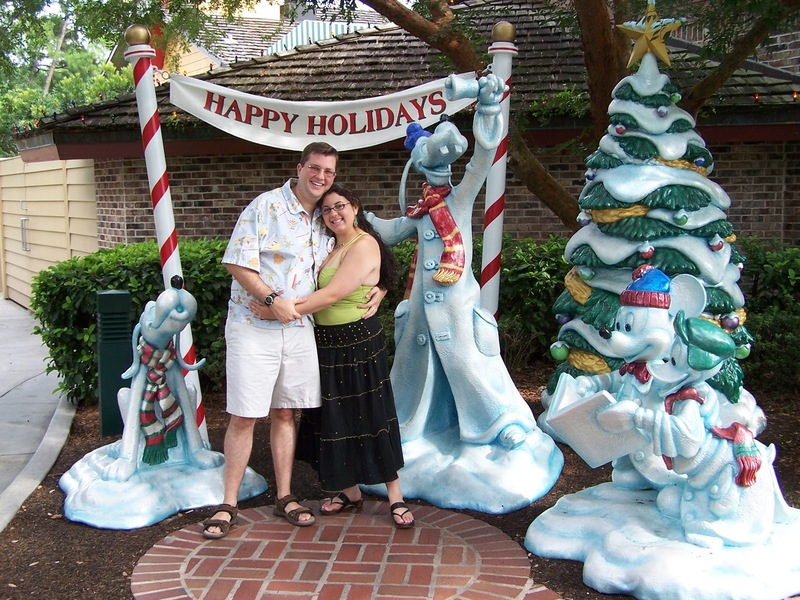 This was going to be our 2006 Christmas cards, but then I got pregnant and that first trimester helped me do a whole lot of nothing for Christmas. Oh well! 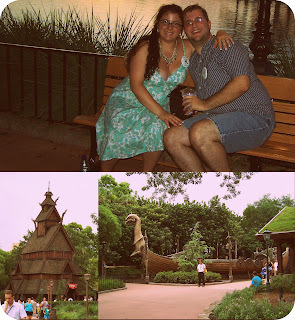 The reason I have to put Norway on my list is because the viking ship is no longer there. To be fair I feel like I should also put ToonTown on my list, but let's be honest. I never liked ToonTown. 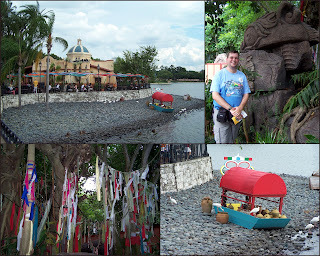 Why do I like the Asia area in Animal Kingdom? It feels like I am there experiencing the culture without having to experience the bad water. Ok, not all of Asia has bad water but I like the safety of Disney while making the experience authentic with the prayer flags hanging in the trees. Also- Expedition Everest. The best ride!! The tree of life is so iconic for Animal Kingdom. Everyone has to pose by it. 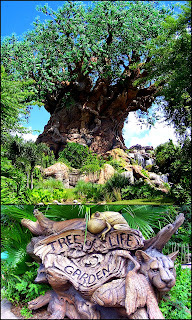 There are 325 animal carvings on the tree and it took 10 artists and 3 Imagineers 18 months to finish this 145-foot tall (That is 14 stories high), 50-foot wide tree. It is just an amazing piece of art and I love it. This is one of my favorite spots to go. My husband and I would LOVE to go to Japan, but it is so expensive. 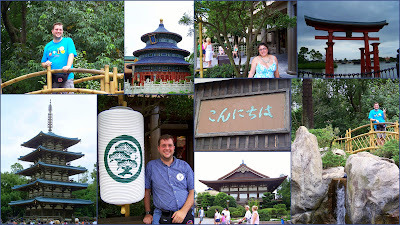 The Japan area of EPCOT is as close as we are going to get, and we think it does a great job capturing the history and culture of Japan. The icon of Disney World itself is Main Street, USA and the castle. The streets of Disneyland and Disney World are the same, but the castles are very different (you can tell by the pictures of both below). Disneyland is home to Sleeping Beauty and Disney World is home to Cinderella. I would rather be Sleeping Beauty. Walt Disney actually put 22-karat gold on the castle spires in order to make them sparkle. Bling bling! What a great list and great pictures! 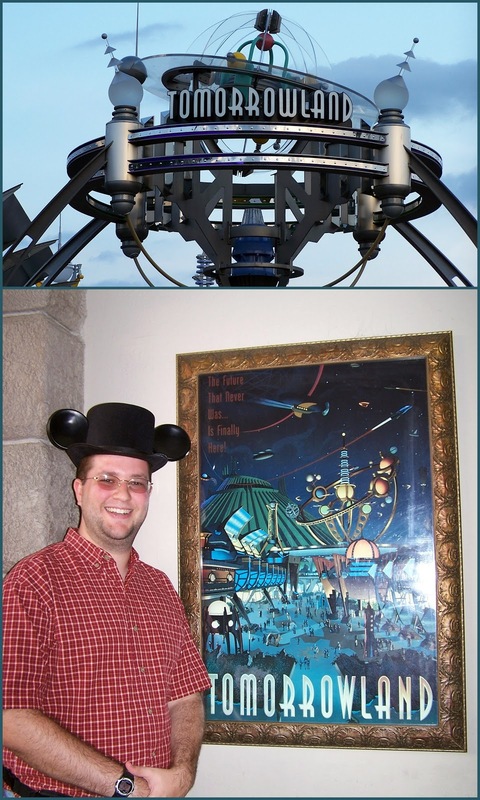 Someday I really MUST make it out to Disneyland. Hopefully soon! Love your list--and your collage photos. 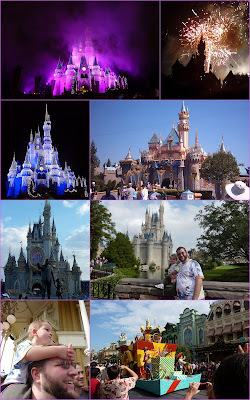 Looking at the WDW/DL comparison, I have to say my favorite castle is the one at Disneyland Paris! Although I do love walking through Disneyland and feeling the history of knowing Walt was there. Awesome list and I love all of your photos!